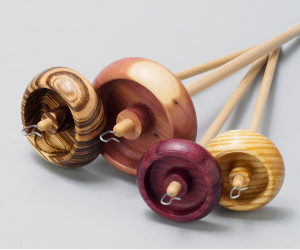 Our popular well-balanced top-whorl drop spindles are designed to give the longest possible spin. The notched whorls make tracking your fiber easy and Jonathan’s hand-made hooks keep your yarn securely in place with no extra wraps. Our four convenient sizes — Featherweight™, Mini™, Midi™ and Maxi™ — offer you the widest range possible in size and function. Whether you’re spinning the finest laceweight or durable rug yarns, we have spindles that will be just right for your projects! We also offer two very special lines of spindles, our Moosies™, made of naturally dropped moose antlers, and Picasso™ spindles made from beautiful Trillium® Picasso™ Art Wood. "They spin like little tornados!" Kary Miksis on the Spindlers Group at Yahoo! Jonathan hand-turns these spindles in a variety of native and exotic hardwoods. Sheila polishes the whorls and tests all spindles for balance. Our most popular wood choices include Zebrawood, Purpleheart, Birdseye Maple, Canarywood, Bloodwood and Bocote; we have many more to offer. Our ‘Special Spindles’ include rare and exotic woods such as Rosewoods, Tulipwood, Black and White Ebony or Karelian Birch, in limited production. Our selection varies as woods are available to us, not all woods are in stock at all times. Looking for something particular — let us know. We try to update our list of available finished spindles every 2 weeks whenever possible. More spindle whorls are waiting to be polished. Looking for something you don’t see listed? Please ask! In the shop: Jonathan turns spindles two mornings per week on a schedule set by spindle size. A special order can take up to 4 weeks and is also dependent on wood availability; thank you for your understanding. Journey Wheel is now Bosworth Spindles. Only the name has changed! Every spindle you purchase in 2019 counts toward your 20% or 50% discount. Purchase 5 spindles from us, and take 50% off any size Standard spindles (same offer for hardwood shafts). PLUS, get a shipping credit of up to $9.50. This offer expires on December 31, 2019!